Choice Sector | Choice Solutions Services, Inc.
Paul Whitmore is the President of Choice Sector, LLC. Paul has been in the industry for 14 years including working on both the Insurance Carrier and Independent adjusting space. Paul brings his 10+ years’ experience of managing large scale Catastrophe events to the Government Disaster Relief space. In past positions, Paul oversaw the inside and outside operations on 50,000+ Daily and Catastrophic claims yearly. His experience includes direct oversight of 20,000+ claims during Hurricane Irene and Sandy. Effective planning, organizing, staffing, managing, technology implementation and program control. Residential and commercial property damage verification; estimation of repairs and replacements in accordance with HUB standards. Centralized intake, information dissemination, secure applicant/claimant data collection, reporting and analytics. Data warehousing, process documentation and improvement and web based workflow tools. Choice Solutions provides a partnership to secure government housing management services to assist state and local governments with both emergency response and long term recovery activities. Choice’s management team has proven performance capacity in providing staffing solutions and services for Housing and Urban Development regulated and state run Community Development Block Grant (CDBG) disaster recovery housing programs and Hazard Mitigation Grant Programs. 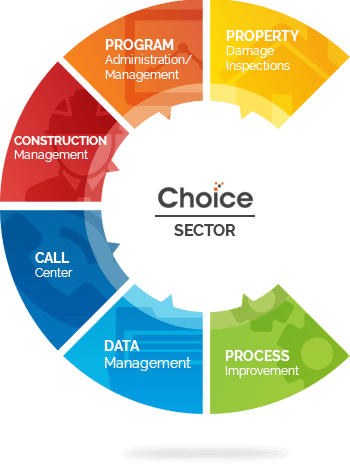 Choice understands the importance of our role in the administration of a disaster recovery program and the transparency required to ensure that those being assisted receive a professional, efficient and effective delivery of service. Managed staffing for over 12,000 damaged assessments. Helped create and manage Quality Control programs. Deployed and trained 30+ damage assessors across Louisiana. Staffed and trained QC positions within our Partner Client’s offices. Choice Government Response Team provides staffing solutions for Housing and Urban Development (HUD) regulated and state run Community Development Block Grant (CDBG) disaster recovery housing programs and Hazard Mitigation Grant Programs.